So you just ordered a chocolate prawn curry for you and your girlfriend, and you’re in the mood to do a little fornicating. Well, you dig out a piece of naan bread and prepare to take a bite and there you see it. 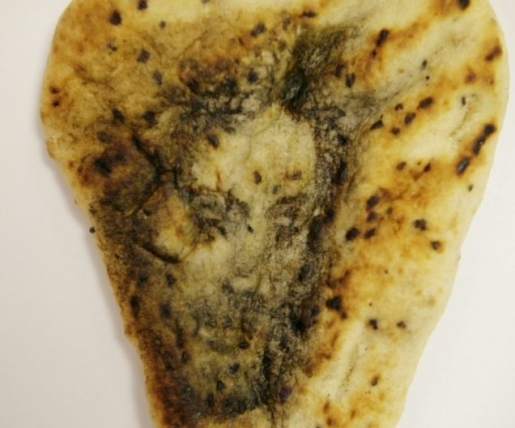 Jesus’s face looking up at you, as if to say, “Dude, lay off all the sinning.” Well, that’s not how it happened to British plumber David Howlett, but he did find Jesus in his naan bread while eating at Esher, Surrey’s India Dining restaurant. When the Bible said Jesus was everywhere, I didn’t know they meant that in the literal sense. I assumed they just meant that in the spiritual sense! Irons, bruises, cow foreheads, Lego statues, potatoes, and now Indian food… where isn’t Jesus these days? Maybe I need to look at my food a little closer before I dig into it; I might be devouring Jesuses (Jesii?) left and right!